A Yum-o! Recap: 15 Awesome Things from 2015 - Rachael Ray's non profit organization, Yum-o! December 23, 2015 • Yum-o! 2015 proved to be another great year for Yum-o!, Rach, and all of our amazing partners. Together, we’ve accomplished so much, raising awareness about important issues and making real, tangible differences in so many lives across the country. We want to say thank you by sharing some exciting updates and major milestones in our three main initiatives: Cook, Feed, and Fund. 1. In our home state, Rachael played an integral part in Mayor de Blasio’s passing of free school lunches for all middle school kids in NYC. Yes! 2. Rachael played a key role in the Alliance for a Healthier Generation’s 10-year anniversary campaign, #Commit2Ten, which raised awareness about the lack of physical activity in schools and challenging the nation to add 10 more minutes of physical activity a day. The campaign reached 32,500,000 people and participants pledged over 750,000 minutes of physical activity! 3. Yum-o! and Rachael celebrated with The Alliance as they marked some major milestones. When we first started working together, the Alliance’s Healthy Schools Program had 285 schools; today, the program supports over 18 million students in over 30,000 schools. That’s progress! 4. Quest to Learn, an award-winning school with both Let’s Move! Active Schools and the Alliance, was featured on the Rachael Ray Show. Rachael visited the school with basketball star Jason Collins. They ate lunch with and hosted a basketball clinic for 40 excited middle school students. Check out the sweet basketball stylings of one of those talented kids here! 5. We tipped our hats to our partners at FoodCorps, who are celebrating their five-year anniversary! The program, which deploys a team of AmeriCorps leaders who connect kids with healthy food in schools, has more than quadrupled its annual service corps, from 50 in 10 states, to 205 leaders serving in 18 states this year! 6. Yum-o! supported the Yum-o!/FoodCorps Leadership Award, which recognized one outstanding service member for making a significant difference in his/her community. Noel Webster, serving in Washington, D.C., won the award and was featured on the Rachael Ray Show along with Jessica Alba and Christopher Gavigan, co-founders of The Honest Co., a FoodCorps partner. As part of the award, Yum-o! also contributed $25,000 and a set of cookware to support Noel’s service and deepen her impact in the District. Go Noel! 7. FoodCorps’ 182 AmeriCorps leaders reached more than 182,000 kids in 535 schools, added 434 healthy recipes to school menus, held 2,350 cafeteria taste tests with fresh produce, and managed 670 garden projects – 70% of the schools FoodCorps served demonstrated improvements in the health of their classroom, playground and cafeteria environments. 8. 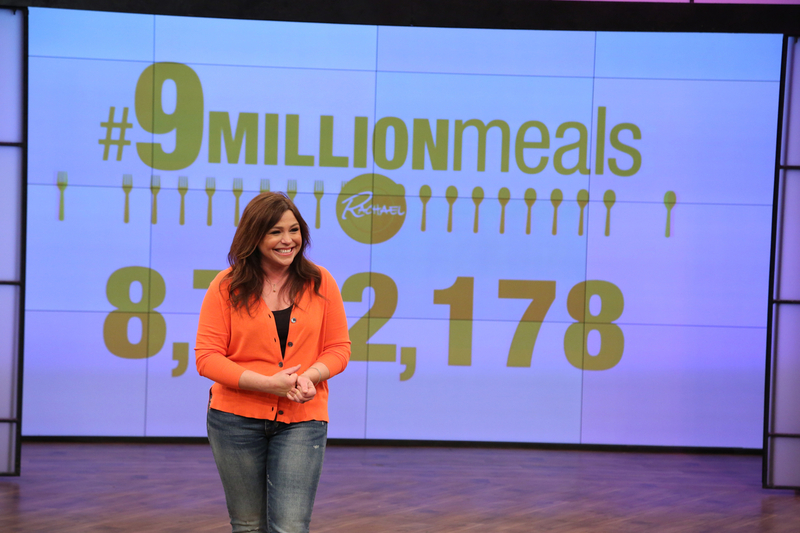 In Season 9 of Rach’s daytime show, we helped launch the #9MillionMeals campaign, which ended in 2015. We are ecstatic to announce that we reached an incredible milestone, surpassing our goal and raising enough money to fund over 11 million meals for hungry Americans in partnership with the Rachael Ray Show and our friends Feeding America & No Kid Hungry. 9. This past year, Yum-o! helped fund breakfast programs in two proof of concept states (Arkansas and Maryland) with our partners at Share Our Strength’s No Kid Hungry that will act as a model for other cities and states around the country. Good to know: Making breakfast a part of the school day is the fastest, easiest way to dramatically improve the lives of millions of kids in the United States. Though 22 million children are eligible for breakfast at school, only about 12 million actually receive it, mostly due to the ways that schools serve breakfast for their students. 10. In their Arkansas program, 1,445 more kids are eating school breakfast this year as a result of our work. SOS worked closely with the state’s Department of Education to implement policy changes that make it easier for schools to improve their breakfast programs. 11. In Maryland, Yum-o!’s funds will help SOS fund new programs. This January, SOS will join forces with Baltimore City Schools to launch a new effort to make breakfast a part of the school day for every one of the more than 85,000 kids. 13. Also through Yum-o!’s donation, Feeding America was able to hire a Regional Fresh Produce Sourcer based in North Carolina starting in October 2015. In only a few short months, the person in this position has sourced over 225,000 pounds of fresh fruits and vegetables, and will continue to procure and source more than 1.5 million pounds by the end of August 2016. 14. Another Yum-o! grant to Feeding America helped procure a total 1.65 million pounds of food. 15. This year, we hit a milestone with our partners at the National Restaurant Association Educational Foundation (NRAEF). Yum-o! has awarded a total of 101 scholarships, ranging from $2,000 to $15,000, through NRAEF with 20 more planned for 2016. We’re going to introduce you to a few of these winners in an upcoming blog post, too! From the bottom of our hearts (and stomachs), thank you for making 2015 a year to remember! And don’t forget: This year we launched this spiffy new website, and we’re now hanging out on Twitter, Facebook, Instagram, and we send out a super-handy newsletter. Join us!